Last week, I wrote a piece on why the erosion of workers’ labor market leverage does not imply that genuine full employment won’t be accompanied by wage growth. It was in response to questions about why wages in the United States weren’t growing faster given that unemployment is pretty low in historical terms. The punchline of the discussion was pretty clear: the definition of full employment is wages rising fast enough to put upward pressure on the Federal Reserve’s inflation target. If wages aren’t rising this fast, then we aren’t at full employment. The eroding relative labor market leverage power of workers does not change this. Another reason often given for slow wage growth in the face of relatively low unemployment is rising monopolization. Does monopoly change any of the calculus I sketched out above? Almost surely not. To be really clear on this, I’m more-than-sympathetic to the view that the U.S. economy has a monopoly problem. Empirical research clearly shows upticks in industry concentration ratios, and a number of large and crucial economic sectors (health care and finance, in particular) are characterized by immense pricing power of producers. Other sectors (mostly technology) have also seen waves of consolidation that have not led (yet?) to rapid price growth, but have raised a whole host of concerns about the intersection of economic and political power. But from a simple-minded economist’s perspective (mine), looking only at trends in wage growth it seems premature to make a strong a case that rising monopolization has been a key culprit in stifling wage growth in recent decades. Instead, it seems to me that the first priority in setting the conditions for better wage growth remains pushing down the unemployment rate and wringing out any last sign of slack from the labor market. In fact, I’d argue further that we can’t even really diagnose the extent of the monopoly problem’s effect on wages and incomes until we wring out this labor market slack and spark some wage-driven price inflation. 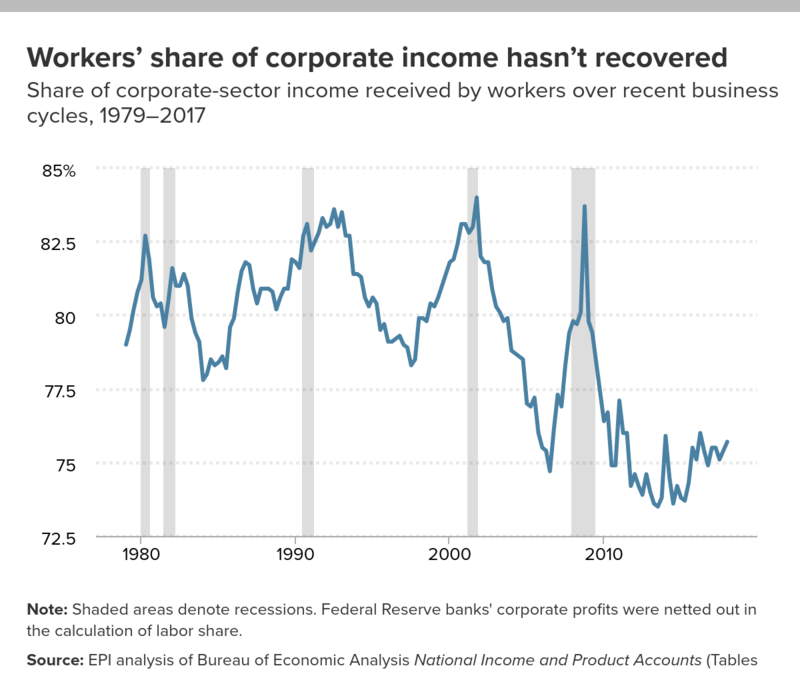 The main piece of evidence pointed to by those arguing that rising monopoly power has driven recent wage troubles is the large and stubborn fall in the share of national income claimed by workers’ pay at the expense of fatter corporate profits. This fall in labor’s share of income is indeed consistent with rising monopoly power, but it is far from dispositive. Consider the recovery following the recession in the early 1990s. Between the third quarters of 1990 and 1997, labor’s share of income in the corporate sector fell by almost 5 percentage points. This a big change—a change like that today would translate into about $600 billion being claimed by capital-owners rather than workers. So, this fall in labor’s share was large, but it was also quite persistent; seven years is a long time to see the labor share not recover from a recession-induced fall. Because most economists in 1997 thought the economy was clearly at full employment even as sluggish wage growth kept labor’s share flat, new theories were pushed forward (just like today) about how sluggish wage growth must be being driven by something else besides labor market slack. Skill-biased technological change was the fashionable explanation at the time. But, three years later, in the third quarter of 2000, labor’s share was just 0.3 percentage points below its 1990 peak and wages had risen sharply across-the-board. What changed in those three years between 1997 and 2000? Unemployment continued to fall and the share of employed adults (and prime-age adults) continued to rise, tightening up labor markets. The real innovation of this period was a Fed that did not preemptively raise interest rates to choke off falling unemployment; instead they waited for actual wage-driven price inflation to appear in the data. When it didn’t, they let the recovery continue. So, the lesson here seems simple: we really have no idea when wage-driven inflation will begin, and we should assume there is further slack to be wrung out of the system until this wage-driven inflation actually begins. If we had failed to follow this advice in 1997 we would have sacrificed the late 1990s high-pressure labor markets that delivered the only period of decent, across-the-board wage growth we’ve seen since the late 1970s. In the end, lots of things in the mid-1990s that looked like skill shortages or biased technological change likely were just too-slack labor markets. I wouldn’t be shocked if today what a lot of people are claiming is the clear signature of rising monopoly power ends up being mostly (not all, but mostly) the symptom of still too-slack labor markets. One further piece of evidence making me think this is that the big fall in labor’s share happened right when the Great Recession hit (that seems awfully coincidental) and it happened fast. The progressive economic agenda absolutely has to include vigilance against monopoly power. But it also needs vigilance in ensuring that policymakers target high-pressure labor markets. Surely we can walk and chew gum at the same time?